It is not an analysis on the timing of the Rapture, nor those details surrounding this event. It is not a guideline to the chronology of eschatological events. It is not an examination the antichrist. It is not an exposition of the Messianic prophecies. It does not go into detail regarding the current scenario in the Middle East. Instead of these more usual eschatological focuses, Rabbi Jonathan Bernis breaks down the gospel message beginning in Genesis to show how Israel and the Jewish people are central to God’s end time plans. He explains why Satan hates the Jewish people, and gives insight into the persecutions of the Jews and the miracle of Israel’s survival. He emphasizes evangelism to the Jews from multiple angles, rightly demonstrating how Jewish evangelism and eschatology are interconnected. He explores some of the lesser known signs that the last days are near. Finally, he advises how believers can usher in the Kingdom of God by supporting, praying for, and evangelizing to the worldwide Jewish community. Bernis’ insights on Israel are excellently and accessibly presented for those believers who are unfamiliar with the Messianic Jewish community and the Jewish roots of the Scriptures, and also for those Jews who have not heard the gospel message that Yeshua is the Jewish Messiah. Those who are well read and accustomed to the Jewish-central gospel may not find as many new insights as the book gives only a broad overview rather than going into much depth. I received a complimentary copy of this book from Chosen Books. Damascus Countdown is the third and final book of the excellent Twelfth Imam Series, which focuses on the eschatological elements of the current situation in the Middle East with many believable creative liberties. This is a series to read in order as the storyline and spiritual message is heightened in each new book, creating suspense and action from a Christian perspective. The Twelfth Imam introduces the coming of the Islamic Mahdi, the major characters (including the story’s hero: undercover CIA operative David Shirazi), and the spiritual and physical conflicts. The character development and political situations deepen throughout The Tehran Initiative. Finally, the Damascus Countdown brings the trilogy to an end with catastrophic military developments, the search for two missing Iranian nuclear warheads, and the finale of each of the smaller character dramas. 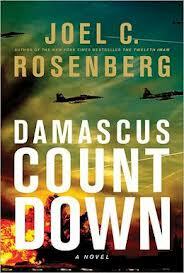 Rosenberg’s writing is realistic, suspenseful, action-packed, and brings the current new’s headlines to life. There is also a bit of romance, which adds scope to the characters and balances the action-oriented plot. Also, the narrative is both apocalyptic and contemporary, making it especially riveting. The ending was not what I would have expected, but–without giving away any details–I do think it worked well within the circumstances of the text. Christian eschatological fiction is difficult to write well since there are so many variables, differing opinions, and unknowns. Considering this, Rosenberg did an excellent job of weaving together believable yet intense situations without bringing in too much controversy. The prophetic scriptures mentioned within the narrative are also appropriately and insightfully utilized. Those who do not believe that Israel is the focal point of God’s eschatological plan and covenant relationship, and those who do not believe that the Middle Eastern conflict has a spiritual root, will not care for this fictitious series. The Christian worldview and gospel message are direct, but well contextualized within the story. As a Messianic believer myself, I appreciate and relate to the major characters’ expressions of faith. The trilogy as a whole gave me a lot to consider in regard to Muslim/Christian/Jewish relations; and this final book especially was quite encouraging and invigorating to read. I received a complimentary copy of this book through the Tyndale Blog Network.